After four weeks here on the farm, we are starting to settle into a routine. D has started his new job training in another city 3 hours away so it is just the grandparents and us!!! He returns the end of September to work in the larger town 15 miles away. Grandpa and I are usually the first ones up. He watches the farm report on tv and reads the paper. I grab my first cup from my keurig and hit my bible study chair. A cat usually sits next to my while I start my morning with Jesus Calling, prayer and then move onto Priscilla Shirer’s Gideon study. Jesus Calling is my favorite way to start my morning quiet time. I am on my 4th year reading it and it still speaks to me each day. I have tried to start other devotionals but keep moving back to this one. 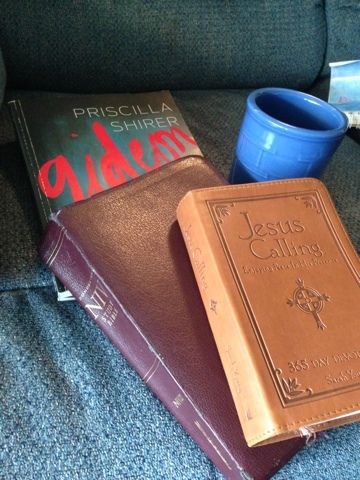 Gideon is Priscilla Shirer’s latest Bible study. What intrigued me about this study is that Gideon was looking for confirmation from God for his purpose just as I am looking to learn God’s purpose for my life here in my new home. I am loving this in-depth learning about the Old Testament stories that we learned in elementary Sunday school classes. Since this spring, I have worked through the stories of Esther, Nehemiah and the Isrealites during the Exodus. I have learned I am so much like the people of the Bible written 1000’s of years ago. Love how it relates to me now! I am learning through Gideon that God loves me faults and all, He has a specific purpose for me, and He does not mind me asking for confirmation over and over as I follow His plan. I don’t know my plan yet but am waiting as He is showing me step by step. After I finish my morning quiet time, I have begun to run on our country road. I used to run in the evening, on a treadmill, in Texas. I ran a couple of evenings when we first arrived here in Idaho and it was so hard! What a change!!! We are at a much higher altitude than my body and asthma appreciated. So back to the Couch to 5K app it was. Here, it is just so nice to run in the morning. I can watch the cows, hear the birds, see where I am running and I can see that it has given me SO much energy for the day. I feel so good! And it is counteracting all the good foods I eating a lot of – like the corn just picked from the field next to the house, the baked goods I’ve been working for the county fair…..
By the time I return, my older two sleepy heads are up and ready to eat their breakfast. While they eat and put on clothes, K and I do her reading and math work. Then we work on family school until Grandma and Grandpa come in from their work. (Grandma is the church secretary and Grandpa farms.) Then we all eat lunch together. While I am getting K settled for her nap (yes, she still needs her naps! 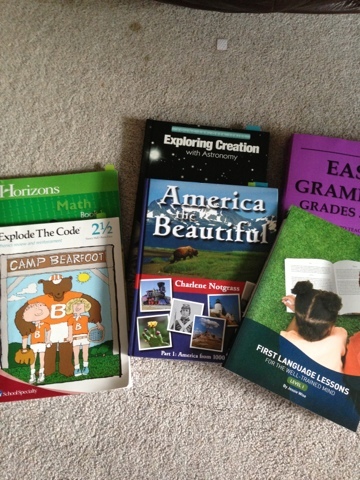 ), the other two finish their math and reading work. After K gets up from nap, we don’t have a schedule! 🙂 Errands in town, helping out great aunt 1/2 mile down the road, playing with kittens, feeding all the animals, watching the kittens play… I have become the resident cook so I make the evening meal for all. It’s been hot (no a/c here!) so I have tried many new crockpots meals and not one has been bad!! I am looking forward to cooler weather in that regards. We have been going to be too late but now that the sun is going down earlier, I hope to get the kids in bed earlier…. well, after the fair is over!! ← What to do with trash?